A social worker has told how she received a phone call from Patrick Quirke complaining that Mary Lowry had "lost the run of herself" over a new relationship and was jeopardising "the wellbeing and safety" of her children. 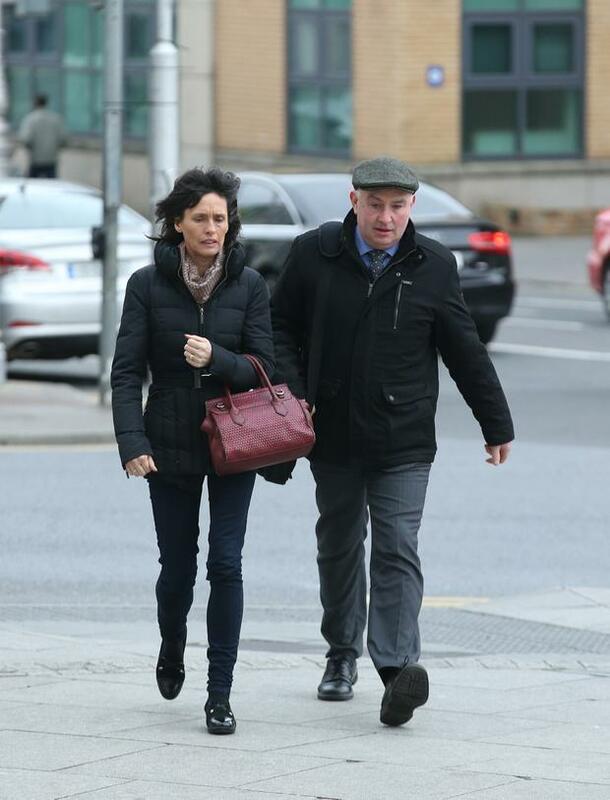 Deirdre Caverley, who gave evidence via a video link from Boston, told the Tipperary murder trial that Mr Quirke had claimed Ms Lowry was leaving her three children unsupervised for long periods while she spent time with her new boyfriend. In 2011, Ms Caverley worked for the HSE as a social worker, based in Clonmel, and on February 4 of that year, as duty social worker, she had received a telephone call from Mr Quirke expressing concern about the welfare of the three Lowry children, she said. "The concerns were about the wellbeing and safety of the three Lowry children, especially an allegation put by Mr Quirke that the children were being left unsupervised for long periods of time, mostly at the weekends," said Ms Caverley. Mr Quirke had claimed Ms Lowry would leave the family home and the children unsupervised from 4pm and would be gone "until the early hours of the morning". This happened usually at the weekends, Mr Quirke had stated, claiming these concerns had been going on "for about three months". Asked by Michael Bowman SC, for the prosecution, if he had given any other information of what else was going on in terms of the family, Ms Caverley replied that he had told her "the wider paternal family" were concerned but were "afraid to address these concerns with Ms Lowry for fear of repercussions". The paternal grandmother was "especially" concerned, Mr Quirke had claimed. Ms Caverley said that Mr Quirke had told her that Ms Lowry had "recently entered into a new relationship" and she was with her new boyfriend during these times when the children were left unsupervised. He had told her Ms Lowry had been widowed three-and-a-half years beforehand. "He felt that, quote unquote, she had 'lost the run of herself' and had become fixated on this relationship," Ms Caverley told the trial. "He added that she was failing to take into account the emotional needs of her three children because of this new relationship." Ms Caverley said she had asked Mr Quirke if Ms Lowry had put childcare arrangements in place if she was going out at the weekend, given that Mr Quirke had advised that the paternal grandmother resided in 'a granny flat' attached to the Lowry home. However, Mr Quirke claimed the children's grandmother was not asked to look after the children when Ms Lowry was allegedly leaving them. He had told the social worker that these concerns over the children had been in place for about three months prior to this phone call. Ms Caverley told the court that given that the alleged concerns were taking place over the weekends and that the social work department did not work weekends, she had advised Mr Quirke to contact An Garda Síochána, which could look into those concerns "immediately". Asked if she had taken any further steps, Ms Caverley replied that she had advised Mr Quirke that she would open an assessment into the concerns and they would make contact with Ms Lowry to meet with her and address the concerns for her children. On February 10, 2011, she carried out an unannounced visit to the Lowry home but found nobody at home. She told the court there was "an individual" on the property at the time of her visit. He did not identify himself and when Ms Caverley asked him whether Ms Lowry was home, he said she was not and provided no indication of when he expected her to return. Ms Caverley then made contact with Mr Quirke by phone advising him that her unannounced visit had been unsuccessful and asked when the best time for another visit would be, given that it was a long drive out to the house from their office in Clonmel. He advised her that 4pm was the best time as the children would be home from school, as would Ms Lowry, who did volunteer work in the community during the day. Under cross-examination by Bernard Condon SC, for the defence, Ms Caverley agreed that Mr Quirke had expressed a view that whilst Ms Lowry was "entitled to be in a new relationship", she was leaving the children unsupervised. She also agreed that she had assured Mr Quirke that he "did the right thing by contacting the social work department". Meanwhile, the trial earlier heard that a search for 'Bobby Ryan' was carried out on Mary Lowry's computer the day before Mr Ryan's remains were discovered. Detective Garda Paul Fitzpatrick, of the Garda Cyber Crime Unit, agreed under cross-examination that analysis of Ms Lowry's computer revealed that on April 29, 2013, the viewer had searched for the key words 'Trace Ireland Bobby Ryan'. Under questioning by Mr Condon, Det Gda Fitzpatrick agreed he was unable to say whether searches carried out on a computer taken from Mr Quirke's house had been as the result of predictive text. The witness agreed that this computer did not have a password and he could not say who was using it at any given time. The trial heard on Thursday that Google searches for "human body decomposition timeline" were found on the computer taken from the house of Mr Quirke. Material on one website accessed addressed how bacteria could be used to measure how long a body had been under water. A link to YouTube videos for 'the Body Farm' study of human decomposition was also found, relating to 'human remains, skin slippage and DNA analysis', which appeared as images, though gardaí were unable to say if they had been watched. A second link to a Body Farm video had a comment from a researcher, saying: "You never forget the smell," said Gda Fitzpatrick. Judge Eileen Creedon informed the jury that evidence in the trial is expected to conclude next week.